a pajama top, and even a dress! Because the fit is good, I feel comfortable testing my amateur pattern manipulation skills on it. For my latest version, I decided that I am over the bias binding at the neck and arms. It always feels constricting and causes pulling. Instead, I drafted facings. 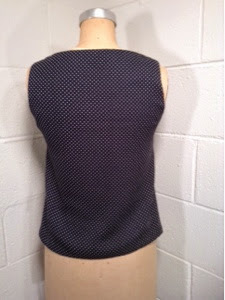 I also raised the back neck 3 inches and lowered the front neckline about an inch and a half. 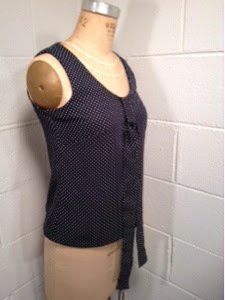 I underlined the sheer, crepe fabric I used with a mystery navy lining purchased in the thrift (that's where the polka dot fabric came from, too). I used the glue trick to marry the two except at the darts, where I hand basted. From there I used french seams on the shoulder and side seams, stitched in the facings which were serged along the lower edges, hand hemmed the bottom with lace hem tape, and neatened it all up by stitching the facings and hem to the underlining. 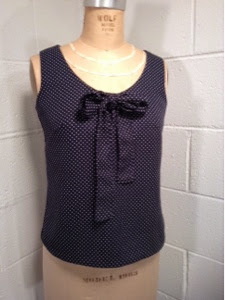 For a little more personalization, I stitched a rectangle, top and bottom, at the neckline and made a long tie to go with it so I could have a bow blouse. I love how this top turned out. It is easy to wear and, to me, looks polished and classic. These are adjectives I would like to be able to apply to my wardrobe more often, and I am trying to sew up some versatile basics. All of them look great! This is when sewing really becomes fun, don't you think? Yes Lizzie, it is fun to play designer! Thanks for the compliment! It means a lot from you, as your garments always look so well planned and constructed.